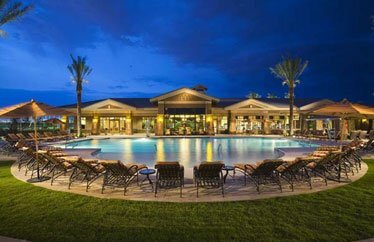 Solera at Stallion Mountain brings resort-style Del Webb living to lucky retirees in fabulous Las Vegas. Opened in 2005, Solera at Stallion Mountain is a well-established active adult community which offers both resale and new construction single-family homes. Its spacious clubhouse features indoor and outdoor amenities, while a prime Las Vegas location puts residents within easy reach of many exciting attractions. Active adults retiring in Southern Nevada will love Solera at Stallion Mountain. This 55+ gated enclave is set within the larger Stallion Mountain Country Club community. A wide range of amenities and a full social calendar supports an active lifestyle that will appeal to many different interests. The community is also nestled just seven miles from the Las Vegas Strip, making it easy for residents to enjoy world-class entertainment, shopping and dining. Social and recreational amenities in Solera at Stallion Mountain are centered around the community's beautiful clubhouse. This 10,000 square-foot facility welcomes residents with a cozy fireside lounge, billiards and sunny game rooms. The state-of-the-art fitness center features cardiovascular and strength-training equipment, as well as a separate aerobics and dance studio. 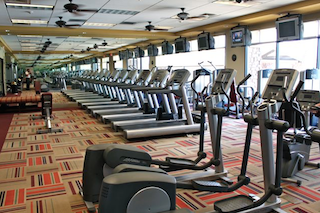 Residents can stay in shape with state-of-the-art fitness facilities including aerobic and dance studios. The clubhouse's multipurpose and meeting rooms offer the ideal setting for a variety of classes, clubs and activities. Residents can take part in many different special interest clubs, including popular groups like the Women's Club, Men's Club, Book Club and Music Workshop. The social calendar features card games, seminars, pot luck dinners, pool parties, Karaoke, line dancing and more. There are also a variety of fitness classes including yoga, tai chi and water aerobics. Solera at Stallion Mountain's beautiful grounds feature a number of outdoor recreations. The resort-style pool area is an ideal place for residents to cool off with a swim, soak up some sun or just lounge with friends. Tennis courts and bocce ball courts provide friendly competition, while walking and biking trails make it easy to explore the community. Built by Del Webb, Solera at Stallion Mountain's single-family homes are designed for main-level living. There are five floor plans, ranging in size from 1,155 to 1,716 square feet. New construction homes offer a variety of optional features and finishes, while every home is fully landscaped for lovely outdoor living. Each single-family model includes two bedrooms, two full bathrooms and an attached two-car garage. Four out of the five designs also has the choice of a den or third bedroom. Open floor plans and spacious great rooms are ideal for entertaining, while master bedroom suites are complete with large walk-in closets and spa-like bathrooms. Upon completion, the community is expected to contain 838 single-family homes. With its affordable homes, engaging activities and prime Las Vegas location, it's easy to see why Solera at Stallion Mountain is a hit with active adult retirees.